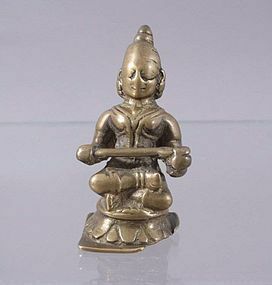 A bronze statue of Goddess Annapurna seated on a round lotus throne holding a scepter. 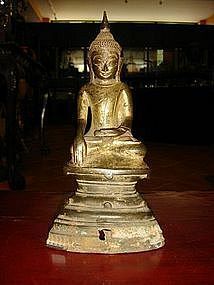 14/15th Century, India. 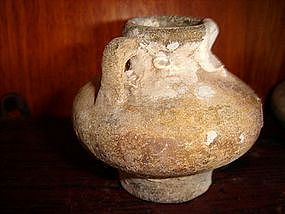 The base is square and has one corner missing, Statue shows prolonged Puja (worship to the object) and has a naturally formed patina. Size: 8x4x4 cm. 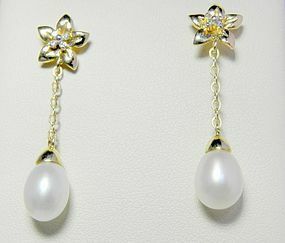 Gorgeous genuine Pearls with good luster drop from a 14K. Yellow Gold Chain with detailed Flower Design at the Top. 8 Diamonds @ 0.04 ct. total weight adorn the center of the flowers. The earrings measure approximately 1.375" in length and weigh 2.9 gr. total weight. Electronically tested gold and diamonds for your safety. 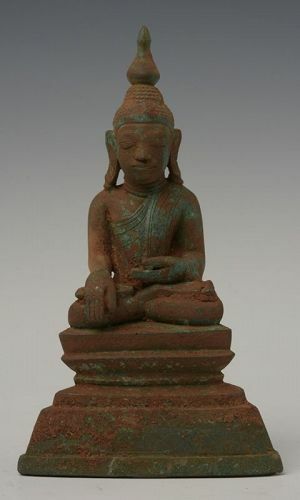 A serene 16th Century SHAN STATE BRONZE BUDDHA, Subduing Mara Position. Good overall condition. Original Patina. Size: H.18.4 cm. x W. 11 cm. 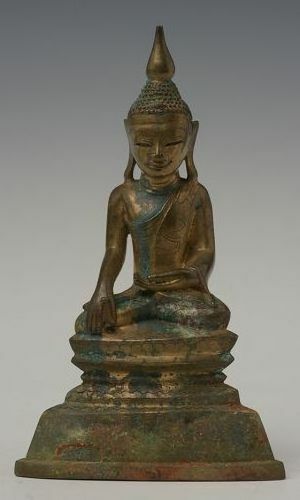 A BEAUTIFUL SMILING BRONZE SHAN BUDDHA, SUBDUING MARA. 16TH CENTURY. 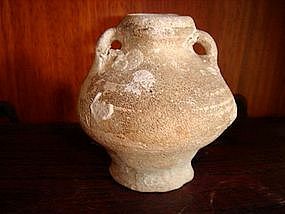 GOOD CONDITION, SIZE: H.16.2 cm. x W. 9.8 cm. RARE! 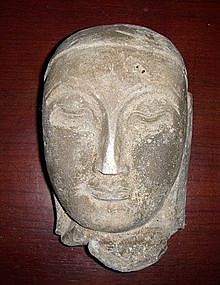 A rare 16th Century AVA Period Limestone Head of Buddha (Burma, 1287 - 1752) with sweeping eyebrows over downcast eyes, typical of Ava art-style, well modeled lips and elongated ears. Carved in high relief as most likely originally set against a back slab. Condition good, one small chip on tip of nose. This head has been nicely mounted on a black stand. Size: H. 20cm x W. 13cm x D. 12cm, excluding stand. 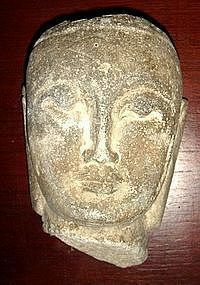 A rare 16th Century AVA Period Limestone Head of Buddha (Burma 1287 - 1752) with sweeping eyebrows and downcast eyes, typical for the Ava period-style, well modeled lips and elongated ears. Carved in high relief as most likely originally set against a back slab. Condition: good except one area of left cheek next to ear shows a little concussion as well as a spot on top of head. This head has been nicely mounted on a black stand. Size: H. 17cm x W. 12cm x D. 10cm, excluding stand. 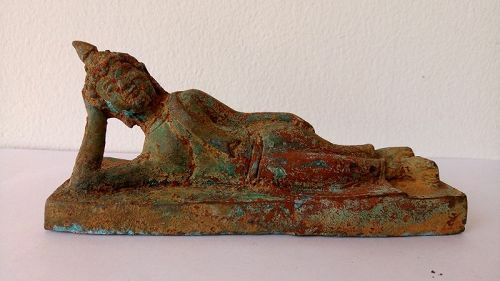 A very rare 17th Century excavated bronze RECLINING BUDDHA, Size: 14 cm x 4.5 cm (5.5" x 1.75"). Naturally formed verdigris patina. Good condition, no damage or restoration whatsoever. Very difficult to find this size reclining Buddha! 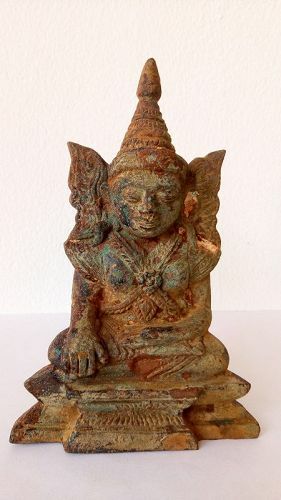 A very rare 17th Century MAHA MUNI EXCAVATED BRONZE BUDDHA FROM BURMA. Good condition, no damage or restoration whatsoever. Naturally formed patina. Size: 13.5 cm x 8 cm (5.5" x 3.25"). Large 18K. 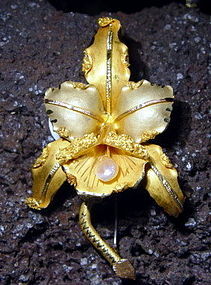 Gold 2-Tone hand made exotic Cattleya Orchid Pin with gorgeously textured petals, superb patina and a wonderful large natural pearl. Size: 3 inches x 1.5 inches. 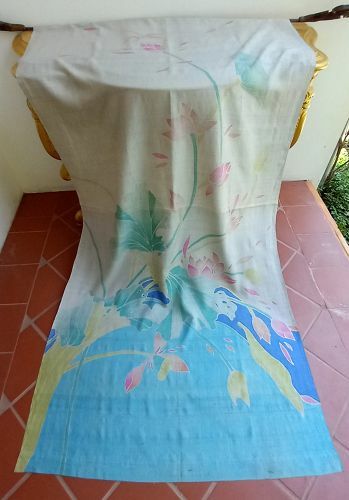 Stylish and large 18K. 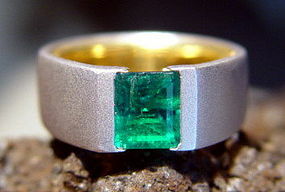 Solid 2-Tone Gold Ring (17.27 grammes), sandblast finish and set with one Genuine Colombian Emerald @ 1.80 ct.
18K. 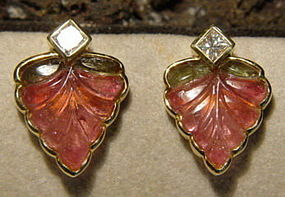 Gold Earrings with 2 hand carved pink and green tourmaline leaves @ 5.00 ct. total weight as well as 2 Princess cut Diamonds @ 0.30 ct. total weight. For pierced ears only! 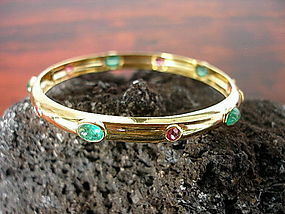 Very elegant and refined 18K. 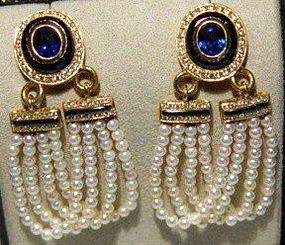 Gold earrings with the finest cultured white Japanese Baby Pearls @ 2-2.5 mm., carved black Onyx, 2 Genuine Ceylon Blue Sapphires @ 1.89 ct. total weight and 104 brilliant cut Diamonds @ 0.76 ct. total weight. For pierced ears only. 18K. 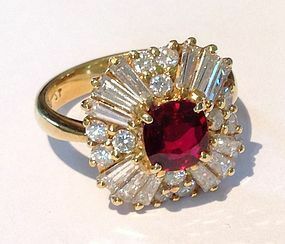 Gold Ring set with a very fine Genuine Pigeon Blood Ruby @ 1.08 ct., 12 Baguette Diamonds @ 1.19 ct. total weight, 12 Brilliant Diamonds @ 0.51 ct. total weight. Rare!